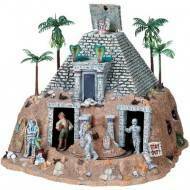 Product Details SKU#: 84770 Figures revolve in and out of pyramid Pea..
You hear a creak upstairs when you're home alone. The hair on the back of your neck stands on end for reasons unknown. Sometimes, the paranormal comes out to play! Now, explore the macabre mysteries of some of the most haunted places in America with America's Haunted Village Collection, available only from The Bradford Exchange, Hawthorne Village Division. You're sure to be amazed by every eerie intricacy and detail! Each issue in this haunted village collection is individually handcrafted in artist's resin to capture every chilling feature, and hand-painted to bring the presentation to life. Plus, each sculpture illuminates and features a wealth of detailing like the ghoulish apparitions that are seen peering out from their windows. Plus, learn about the events that took place in each historic place and what is thought to haunt the space with the included printed newspaper cards.